SanDisk has started shipping a 2GB microSD card. Both 1 and 2GB versions were announced earlier this year at CES. 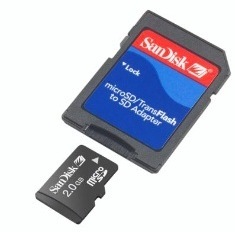 microSD (formally known as TransFlash) has become one of the leading formats for mobile phones. Almost a third of phones sold worldwide this year are expected to have removable memory. The 2GB launch was timed to go along with the Chocolate's debut on Verizon Wireless. Verizon's retail stores across the country will be stocking the 2GB chip for $99.